Jay Austin wants to sell used cars in theworst way…and that’s exactly how he does business at his dealership.Promising much more than he can ever deliver, he’ll do whatever it takesto sell a car. His manipulative ways permeate all of his relationships –even his wife and son know they can’t trust him. But as Jay works on restoring a classic convertible, he sees God workingto restore him as well. Coming face-to-face with the reality of how hetruly conducts himself, Jay Austin begins the ride of his life as hecommits to honouring God with his business, his relationships – and hislife! 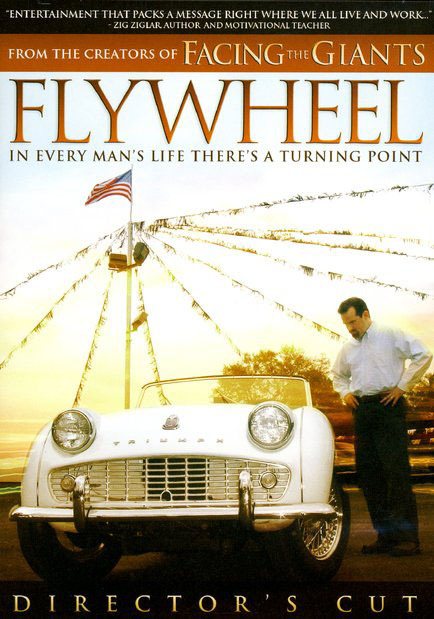 'Flywheel Director’s Cut' DVD is re-edited with lots of new bonusfeatures, including an 8-part Bible study featuring clips from the film,Out-takes, deleted scenes and ‘The Making Of Flywheel’. Created with the same faith-filled warmth and humour as 'Facing TheGiants', 'Flywheel' was written by the Kendrick Brothers and stars AlexKendrick (who played Coach Grant Taylor).